Armchair System optimizes operator comfort. Model HFC-100 features high backrest that provides back and side support and reclines 80Â° in 2Â° increments. Seat cushion tilt adjusts 3-11Â° in 4 increments to minimize thigh pressure. Seat cushion depth adjusts forward 2.4 in. in 5 increments, accommodating larger operators. Five inch wide control consoles and armrests are horizontally adjustable and flip back for operator access. Most 1-, 2-, and 3-axis joysticks can be configured to fit inside consoles. The HFC-100 fixed armchair system is designed by J.R. Merritt to provide the ultimate in operator comfort. The standard seat of this system has a high backrest for the ideal amount of back and side support. The 80 degree backrest recline is adjustable in 2 degree increments, while the seat cushion tilt adjusts 3 degrees to 11 degrees in four increments to reduce thigh pressure. 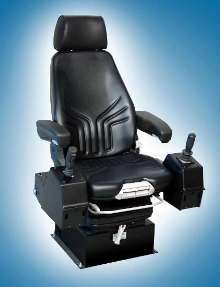 In addition, the seat cushion depth is adjustable forward 2.4" in five increments, accommodating larger operators. All of these ergonomic features enable the operator to work more productively for longer periods of time. With tight cabins in mind, J.R. Merritt equips this chair system with 5" wide control consoles. Both the consoles and armrests are horizontally adjustable, and they flip back to facilitate operator access. Most of J.R. Merritt's 1-, 2- and 3-axis joysticks can be configured to fit comfortably inside the compact consoles. If needed, amplifier cards with PWM can be furnished with the joysticks to control most brands of electro-hydraulic proportional valves. The HFC-100 armchair system is featured on the J.R. Merritt website at www.jrmerritt.com. Or, contact the company for complete information, by phone at (800) 333-5762, by fax at (203) 381-0400 or by email at info@jrmerritt.com.